It’s the first day of Gartner’s BPM summit in Las Vegas, so expect to see a lot of vendor announcements this week. Some, like Global 360, had the decency to arrange for a briefing for me last week so that I could write something about their announcement in advance; others, who shall remain nameless, waited until Friday afternoon to send me a content-free advance press release that is not worth repeating (although some undoubtedly will). You know who you are. Global 360’s products are tightly tied to Microsoft platforms, and they use Visio as their business-facing process modeler. Although I have a philosophical problem with not using a shared model approach to process modeling, I’m also realistic enough to know that Visio for process modeling is not going away any time soon. There’s some nice things in Visio 2010 that are allowing them to move Visio from a passive role to a more active role, although only in the Premium edition. 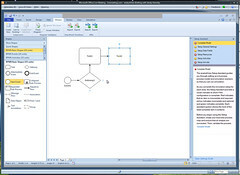 Visio 2010 Premium supports BPMN 1.2 with a stencil, and also has a number of ease-of-use enhancements to make it easier to draw process diagrams, such as the ability to easily add connected shapes, auto-alignment, reflowing the process map to vertical or horizontal alignment, and allowing a selected group of elements to be converted to a subprocess. In short, Visio is becoming a competent BPMN modeler, although the key will be how quickly they will release BPMN 2.0 now that the standard is with the finalization taskforce and can be expected to be released pretty much as it is currently defined. For those of you who aren’t that familiar with the differences between BPMN 1.x and 2.0, there are a number of new event types (some of them will be rarely used, although the non-interrupting boundary events are going to be a big hit), the addition of standardized task types, and most importantly, a serialization format that can be used for process map interchange between tools. So far, that’s just Microsoft Visio Premium. What Global 360 provides is the analystView plugin to add simulation to these BPMN models right within Visio. This is intended to be simulation “for the masses”: really, we’re talking simulation for the statistically-minded business analyst, although they’ve made the user interface fairly simple, and will include tutorials and interactive help to support the user who is just getting to know simulation. This actually runs discrete events through the model, and can pump out the results to the managerView analytics just as if it were an executing process. It can also do the reverse, taking historical data from managerView and using it as baseline data for the simulation. 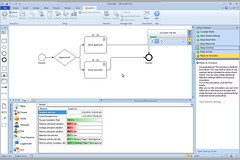 There are a number of fairly sophisticated simulation functions: data can be simulated through the model; routes can be selected conditionally rather than just weighted decision; roles can be used; and specific statistics can be tracked, such as logged events, timed sequences of events, or SLAs for the entire process, an activity or a timed sequence. After watching the simulation in action, I’m left with two thoughts: first, it looks quite fully functional, although you’re still going to need some basic statistical background to use it; and second, I’m very glad that they didn’t use little animated running people while the simulation is running, because we’re all just so over that as a user experience. The simulation engine, by the way, is what they acquired from Cape Visions around 2004, which is the same as is used in IBM FileNet and Fujitsu BPM products for simulation. A second part of this announcement, also riding on the shoulders of Microsoft, is their SharePoint integration. Process maps created with Visio can be checked in to SharePoint for collaboration; although this can be done with the prior version of SharePoint, the 2010 version allows the process models to be checked in as Web Drawing files, which allows viewing and commenting by non-Visio users, where the built-in Visio services allow the diagram to be viewed as a web part. A process model in this form is still fully functional, for example, clicking on a subprocess will link to that subprocess, and clicking on an element shows the parameters associated with that element, including the simulation parameters. When an analystView simulation is run, the simulation data is stored in SharePoint with the process model as XML; although Global 360 hasn’t yet launched the web part that will allow viewing of the simulation data directly in SharePoint, that’s expected to come along within a couple of months. The critical component here is Visio 2010, which is still in beta, required for the BPMN 1.2 support; SharePoint 2010 is a nice-to-have because it allows non-Visio users to collaborate on process models, but isn’t required for any of the other functionality. Global 360 is hedging on the BPMN 2.0 support, saying that they’re pushing Microsoft to support it as soon as it is available, but if Microsoft doesn’t come through by the end of 2010, they’re going to have to make a move on their own. There’s also the issue of what happens when Microsoft decides that they really want to play in the BPM market, although Global 360 (and many other Microsoft-centric BPM vendors) are so far ahead of them, it will likely take an acquisition to have any of the current BPM vendors lose any sleep over it. In the meantime, Microsoft and Global 360 are doing some nice co-marketing, and Microsoft’s Visio website will offer the Global 360 analystView plugin for sale ($349) as well as Visio Premium 2010 ($800). This isn’t the first thing that Global 360 has done with SharePoint, however: they built 20-30 “ViewParts” that are SharePoint web parts that provide a front-end to the Global 360 process engine, allowing you to assemble a user interface for executing their processes in a SharePoint portal view. They’ve done quite a bit of research into persona-based user interfaces, which has resulted in their viewPoint set of interfaces tuned to each particular type of user: builders, managers and participants. The newly-released analystView is for analyst-type builders, whereas some of the userView applications that I saw last fall are for end users in various roles. For example, a user’s inbox would show their current task list, a Current Workload feedback widget tell their supervisor how busy that they feels they are, a performance comparison with other users, and a message center for other work-related information. A heads-down transaction processing user’s view could be similar, but with push-type task lists instead of browsable lists. 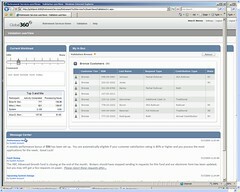 A user can then open a work packet, view any attached documents, and complete the tasks within the packet. A supervisor, on the other hand, would see the managerView, containing SLAs, warning and reports, and allowing the supervisor to reallocate work and roles. The designerView, for more technical builders than the Visio tools described above, provides a process modeler with palettes for standard BPMN process elements, but also messaging, document functions, scripting and a variety of other integration functions. The data model for the process is fully exposed and integrated with the process model, something that more BPM vendors are realizing is critical. Comments can be added on each element in a model, then a documentation view collects all of those comments into a single view. The process models were not fully BPMN compliant when I saw them last fall, although that was planned for early 2010. Once a process is designed, a builder can create the UI using web parts that are auto-wired when dropped onto the SharePoint canvas. 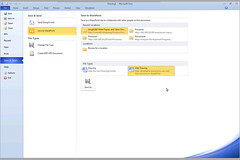 Composite applications can be built using SharePoint or ASP.Net; a number of production-quality starter applications are provided out of the box. I’ve been waiting for the analystView piece, announced today, to complete this picture: now they have business-facing process modeling and simulation in Visio with analystView, collaboration on the process models in SharePoint, redrawing (or at least enrichment) of the process models in the designerView, and user interface design in SharePoint. The suite feels a bit disjointed, although taking advantage of the penetration of Visio and SharePoint within enterprises could be a huge advantage for Global 360. The major challenges are direct competition from Microsoft at some point in the future, as I discussed previously, and the slow migration of many organizations onto the 2010 versions of the Microsoft platforms required for full functionality. Given that I still have enterprise customers using SharePoint 2003, that could be a while yet.